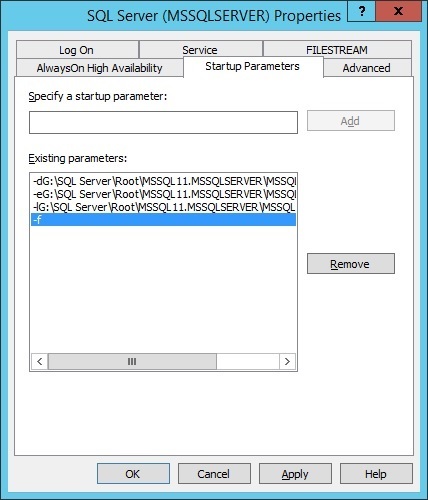 Windows could not start the SQL Server (MSSQLSERVER) on Local Computer. For more information, review the System Event Log. If this is a non-Microsoft service, contact the service vendor, and refer to service-specific error code 14. Now, the only thing to know what would have happened is the Event viewer. 2. Type “Event Viewer” in search box on Windows 8 and above. Error: 49910, Severity: 10, State: 1. (Params:). The error is printed in terse mode because there was error during formatting. Tracing, ETW, notifications etc are skipped. Error: 17312, Severity: 16, State: 1. (Params:). The error is printed in terse mode because there was error during formatting. Tracing, ETW, notifications etc are skipped. Error: 17300, Severity: 16, State: 1. (Params:). The error is printed in terse mode because there was error during formatting. Tracing, ETW, notifications etc are skipped. Error: 33086, Severity: 10, State: 1. (Params:). The error is printed in terse mode because there was error during formatting. Tracing, ETW, notifications etc are skipped. Error: 701, Severity: 17, State: 65. There is insufficient system memory in resource pool ‘internal’ to run this query. 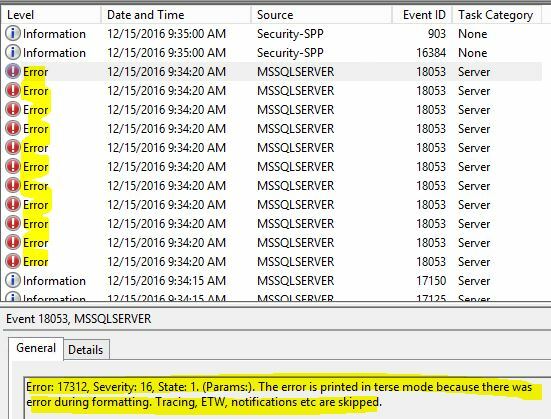 SQL Server was unable to run a new system task, either because there is insufficient memory or the number of configured sessions exceeds the maximum allowed in the server. Verify that the server has adequate memory. Use sp_configure with option ‘user connections’ to check the maximum number of user connections allowed. Use sys.dm_exec_sessions to check the current number of sessions, including user processes. I’ve removed unnecessary part here as the error log was too long, highlighted the real cause of the issue, and that is: Failed allocate pages: FAIL_PAGE_ALLOCATION 1. 2016-12-15 09:34:14.82 Server SQL Server detected 2 sockets with 10 cores per socket and 10 logical processors per socket, 20 total logical processors; using 20 logical processors based on SQL Server licensing. This is an informational message; no user action is required. 2016-12-15 09:34:14.82 Server SQL Server is starting at normal priority base (=7). This is an informational message only. No user action is required. 2016-12-15 09:34:14.82 Server Detected 143359 MB of RAM. This is an informational message; no user action is required. 2016-12-15 09:34:15.27 Server Using dynamic lock allocation. Initial allocation of 2500 Lock blocks and 5000 Lock Owner blocks per node. This is an informational message only. No user action is required. 2016-12-15 09:34:15.27 Server Lock partitioning is enabled. This is an informational message only. No user action is required. 2016-12-15 09:31:14.07 Server Error: 49910, Severity: 10, State: 1. (Params:). The error is printed in terse mode because there was error during formatting. Tracing, ETW, notifications etc are skipped. 2016-12-15 09:31:14.08 Server Error: 17312, Severity: 16, State: 1. (Params:). The error is printed in terse mode because there was error during formatting. Tracing, ETW, notifications etc are skipped. 2016-12-15 09:31:14.08 Server Error: 17300, Severity: 16, State: 1. (Params:). The error is printed in terse mode because there was error during formatting. Tracing, ETW, notifications etc are skipped. 2016-12-15 09:31:14.08 Server Error: 33086, Severity: 10, State: 1. (Params:). The error is printed in terse mode because there was error during formatting. Tracing, ETW, notifications etc are skipped. 2016-12-15 09:31:14.08 spid14s Error: 701, Severity: 17, State: 107. 2016-12-15 09:31:14.08 spid14s There is insufficient system memory in resource pool ‘internal’ to run this query. In the Error Log above you can also see the Error IDs we saw in Event Log, I’ve highlighted them with the Memory Clerks. 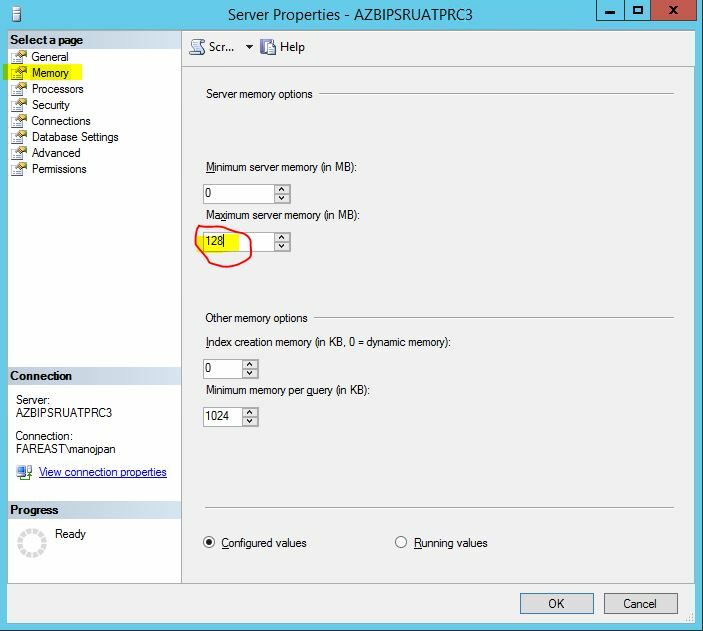 Open SQL Server Configuration Manager (SSCM) –> select “SQL Server Services” –> right click on SQL Server service, and select Properties. Add “-f” as Startup Parameter, as shown below. Again go back to the SSCM and Start the SQL Server service, this time it will start as you have set SQL Server to run with minimum configuration, and thus it will run on limited memory. –> Now I opened the SSMS and connected to the respective instance, under Object Explorer right click on Instance name, and selected Properties. Moved to the Memory page and checked the Maximum server memory (in MB) setting. It was just 128 MB, so I increased it to 110 GB as my server RAM was 140 GB. –> Again went to the SSCM and removed the Startup Parameter “-f”, and restarted SQL Server services. Now I was able to login to SQL Server instance without any issues !! !